Two deserts, two ecosystems, separated for the most part by elevation come together at the park. 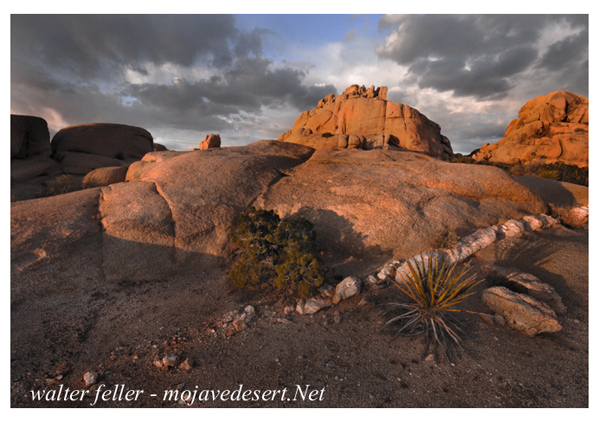 A vivid contrast between the Colorado and Mojave deserts can be observed. A high (over 3,000 feet) desert with more annual rainfall than it's low desert counterpart, home to extensive stands of Joshua Tree. Habitat to creosote, ocotillo and cholla, the lower, drier Colorado occupies the eastern portion of the park. Map to 360° virtual photos of points of interest within Joshua Tree NP. List of photo tours in the park.